Homes for sale in The Monmouth, a unique active adult community in Wall NJ. 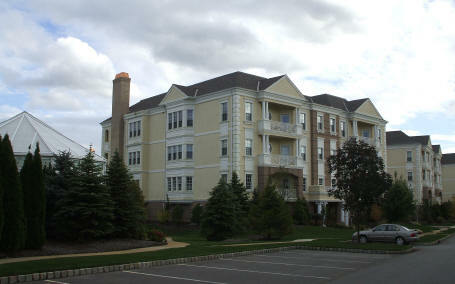 The Monmouth is a luxury Active Adult, gated community in Wall, NJ. Conveniently located at the junction of Routes 35,70 and 34, it’s near the Garden State Parkway, shopping malls, theaters, libraries and museums. In addition, the Jersey Shore is minutes away. Dining, live music and entertainment are nearby. The original plan was for sixteen buildings to be built in The Monmouth, with construction beginning in 2006. And each building would have 6 homes, hence total of 96 luxurious homes. However, they only built 8 of the buildings, and it’s unknown if the project will be completed. No expense has been spared in appointing these fine homes for gracious living. There are two homes on each floor, and all homes in The Monmouth have three bedrooms and 3.5 baths with over 4,000 sq ft. Each of these luxurious residences has multiple balconies, and they are outfitted with all of the amenities one would expect of a million dollar home. These homes all have gourmet kitchens, lavishly appointed master suites which include his and hers baths, libraries and more. Each of the homes are served by key operated elevators, additionally, each of the homes has a private, temperature controlled two car garage. The magnificent clubhouse features a state-of-the-art fitness center, in addition to an 18 hole putting green. There’s a magnificent ballroom, cozy library, card rooms and more. When it’s cold outside, you can swim in the indoor pool. And when the weather is warm, socialize with friends and neighbors by the outdoor pool, Or meet with your new friends in the multi-purpose room. Consequently, this is all part of the luxurious lifestyle that you would expect in a community like this. While The Monmouth doesn’t have a golf course, there are many golf courses in Monmouth County. The Monmouth is in a great location because it’s near fine dining, shopping, transportation, entertainment, golf and marinas. Besides, it’s located just 3 miles from the beach. Commuters love The Monmouth because train service is nearby in Manasquan.